SATO America, Inc., a leader in barcode printing solutions for over two decades, is recognized for delivering rugged dependability and reliable performance throughout its product line, which includes direct thermal and thermal transfer printers, RFID Smart printers, OEM print engines, 10.5-inch wide web printers, printer accessories, label design software, labels, and thermal transfer ribbons. 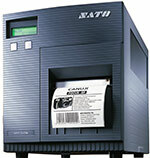 The new "e" Series of printers brings the latest in technology to the world of Thermal Label Printing. The CL"e" Series printers offer high speed data transmission, unparalleled processing speed and large amounts of on-board memory to quickly and easily manage any label printing requirement.